As much as I liked the ASUS Lamborghini, I was having mixed emotions with it. On one hand, it certainly looks pretty, has plenty of power and comes with some great limited edition accessories. Not to mention, you get a feeling of total exclusivity with Lamborghini’s sport scar namesake alone. However, the high price of entry for an otherwise, above-average laptop just doesn’t justify the purchase. You can find comparatively equipped laptops out there for almost half the cost of the ASUS – some even offer more features and expandability options too. Not to mention, the lack of a widescreen display certainly hurts when one has to consider a laptop costing over two grand. 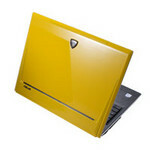 The target buyer of the Asus Lamborghini VX1 isn't exactly looking to go incognito: The laptop's bright yellow lid, with a shape evocative of a sports car's spoiler, prominently features the Automobili Lamborghini logo. And the sports-car resemblance doesn't end with appearance--the Lamborghini VX1 raced through our performance benchmarks, keeping up with laptops that incorporated higher-end components. Unfortunately, like an actual Lamborghini, the $2,799 VX1 costs quite a bit more than its competitors, including the similarly car-themed Acer Ferrari 5000 ($2,399). Laptops with no special cosmetic treatment, such as the Dell Inspiron E1505, cost even less. But if you're dead set on paying the premium for a laptop with sports-car styling, you won't get burned by the VX1. To call the Lamborghini VX1 "expensive" would be a massive understatement – "astronomical" would better describe the premium price tag mounted on this laptop. One cannot help but expect pure perfection from such a fine machine after paying so much. Alas, Asus’ car-laptop hybrid lacks additional features found in other laptops (which are ironically cheaper) like hard drive protection, spill-proof keyboards or a one-key data backup support. On the upside, the VX1 shows excellent potential for meeting the computing needs of heavy computer users that multi-task with numerous applications. Another plus point goes to the fantastic LCD display for watching movies and the device’s excellent internal speakers. As the fruit of a relationship between ASUS and exotic car manufacturer Lamborghini, the ASUS VX1 is designed to offer exceptional performance, stunning aesthetics, and solid reliability. Combining a vast array of the latest flagship mobile hardware, the VX1 is an impressive success in nearly every respect. 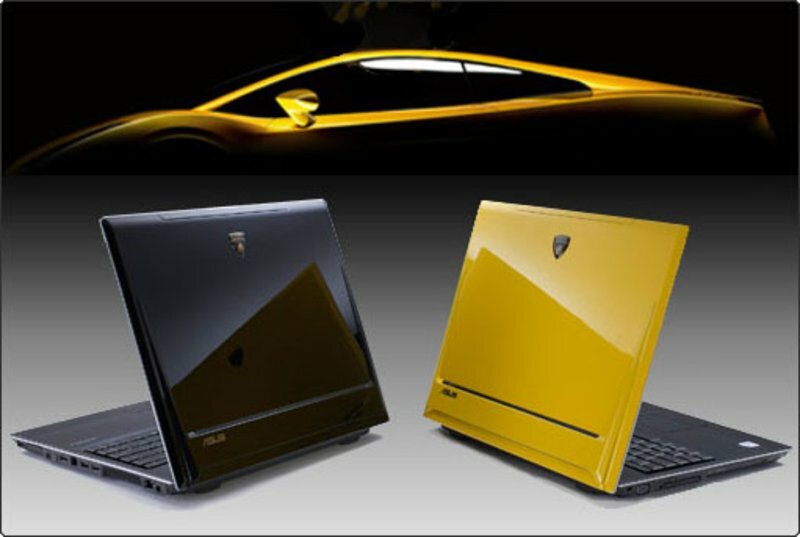 As is the case with the supercars produced by Lamborghini, the ASUS VX1 is a piece of hardware which many will lust over. Unfortunately, the notebook also carries the same price premium as the automobile with a price tag of roughly $2799. Regardless, the system does come with an impressive list of top-notch equipment including a blisteringly fast Intel Core 2 Duo T7400 processor, 2GB of DDR2-667 memory, a spacious 160GB drive, and an 8x Dual-Layer DVD burner. In addition, the system also utilizes a 15" SXGA+ LCD which comes with a Zero Bright Dot warranty from ASUS where the company will replace the panel should a single dead pixel crop up. All of this is encased in an extremely lightweight package which is finished with a quality mirror-like paint job that is sure to attract attention. The Asus-Lamborghini is an excellent laptop that is extremely well engineered from a design perspective. It’s very sturdy and ridgid ensuring it can withstand the rigours of daily use. 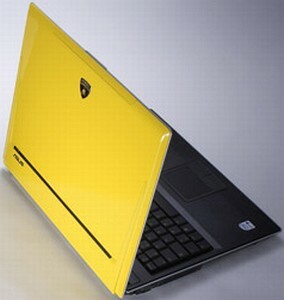 The VX1’s sharp looks and high grade paint makes the laptop truly a work of art and I think it’s worthy to bear the Lamborghini badge. The VX1 comes with a unique set of accessories including Lamborghini branded laptop case and sleeve, bluetooth mouse, and leather mouse pad. There is even a Lamborghini heritage booklet which makes you feel like you’re buying a piece of automotive history. However, the great design, desk appeal, and accessories come with a hefty price tag. The older 5E003P and 5E004P models retail for $2800 USD with a Core Duo T2500, so you can expect the 5E009P model (like the one we reviewed here today) with the Core 2 Duo T7400 to be priced higher initially. Just like the car, the Asus Lamborghini delivers the exclusivity, performance, and high-end touches that buyers of exotic machines demand. Those thinking of buying the Asus Lamborghini VX1, get one thing straight: Like the cars that share its name, it’s not for those wishing to be inconspicuous. From its bright-yellow paint job to the suede-trimmed black carrying case included in the package, everything shouts “look at me.” And like the Lamborghini cars, the $2,799 VX1 has the performance to defend its status-symbol stance. If you had that classic poster of a Lamborghini Countach in your bedroom as a teenager in the early 1980s, you’ll lust over the VX1. The yellow-and-black machine is certainly a sight to behold, with an angular lid reminiscent of the airfoil on the deck lid of an exotic sports car, complete with the Lamborghini logo. The VX1 is large, with a 15-inch screen, but Asus has kept the weight to a reasonable 5.6 pounds. The affair between luxury cars and powerful laptops began with the partnership between Acer and Enzo Ferrari that produced the Acer Ferrari 4000. Itronix, another laptop maker, made a modest attempt at emulating GM's Hummer SUV with its Hummer Laptop IX600. This year, ASUS revs its engines by introducing the ASUS VX1 Lamborghini ($2,799 list). This new partnership with Ferruccio Lamborghini adds another car emblem to a growing number of automotive-inspired mainstream laptops. One of my hands-down favorite luxury cars is a yellow Lamborghini Gallardo Spyder, so it was only fitting that ASUS would send me a VX1 with a bright yellow top (it's available in solid black, too). The laptop's lid slants downward toward the front bezel just like the hood of a real sports car.